Nothing huge going on with the Polyscias seedlings exactly, but I thought learning a little bit more about how Polyscias works was maybe worth a post. Maybe three or four others have visible cotyledons ("seed leaves"). 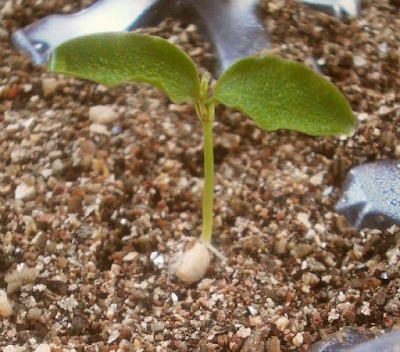 There's still a ways to go before I can officially say that I've grown Polyscias fruticosa from seed -- the next hurdle will be transplanting to soil -- but I never anticipated getting this far with it, so even if no plants actually result, I think this is technically still a success. For various reasons, it might be better if the seedlings fail to transplant. I was in the husband's office a few days ago, telling him that I had had nine Polyscias seeds germinate already, and he was all, cool, that's neat about it. And then as I was saying something else, can't remember what, I saw his eyes drift over to the parent Polyscias -- by now approximately 6 feet tall and 2 feet wide (2 m x 0.7 m) -- and he interrupted me. "You said nine? There are nine?" "You said nine? There are nine?" LOL! That makes for a very comical mental picture. Obviously he was only half listening to you. Hilarious when the full import finally registers! (Also nice that he apparently is learning what some of the plants are!) Might be wiser not to update him should anymore sprout.